Promotional 4.88 x 2.12 school bus shaped full color magnets is a best way to boost reputation of your educational institution or nonprofit organization. This magnet can be gifted during school events, fundraisers, tradeshows, tour programs, corporate events or educational events when large participation of your targets is expected. It is fit for all marketers who are trying to make meaning out of their budget investments. This magnet can be offered as a mailer or you can hand it out personally or gift it with some purchases or as a compliment for some achievements. 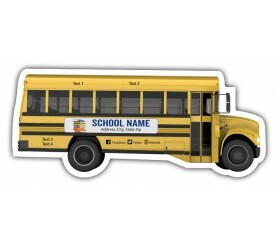 Request a quote to know wholesale discounts on custom school bus shape full color magnets. Product Size: 4.88 in. x 2.1214 in.